(Suva, Fiji) – Traditional governance, quality and affordable education, youth and women and were some of the key issues raised to the Pacific Islands Forum Secretariat from the Pacific Regional CSO Forum in Suva today. The issues raised by more than 40 CSO reps from over 10 countries in the Pacific region were discussed with a representative from the Pacific Islands Forum Secretariat Non State Actors Programme during a session at the Pacific Regional CSO Forum this morning at the University of the South Pacific, Suva, Fiji. Facilitated by the Pacific Islands Association of NGOs, the forum includes CSO representatives from Samoa, Tonga, Cook Islands, Niue, New Zealand, Fiji, Vanuatu, PNG, Solomon Islands, Palau, RMI, FSM, Tuvalu and Kiribati. PIANGO Executive Director Emele Duituturaga said she was glad that PIFs was willing to carry out the consultations during the Forum and allowed submissions to be made by their national liaison unit representatives in Suva. “CSO’s must use spaces as such to discuss regional policies and its impact and highlight the links to their national and grassroots experiences,” Duituturaga said. “It is a call to revisit why we do what we do as civil society organisations in the Pacific particularly in the work for sustainable development,” Duituturaga said. “The consultation gave our NLUs the opportunity to engage, highlight and debate some of their issues and challenges and start the process of prioritising needs as something our regional leaders can consider,” Duituturaga said. Duituturaga also acknowledged the important role of partnerships in civil society work particularly in advancing the Agenda 2030. The meeting which is supported by CPDE, International Forum for National NGO Platforms (IFP) and the European Union will end this afternoon. 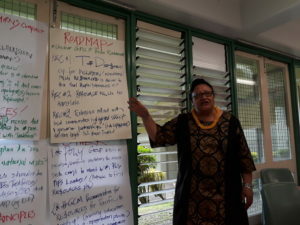 Caption: Pefi Kingi makes a presentation during the Pacific CSO’s forum in Suva.